I have read on several occasions that you identify William Wilberforce as one of your heroes. Wilberforce is also one of my heroes. Not least among the reasons for this, is his persistence in letter writing to government officials, to call for the humane treatment of people who were oppressed. He wrote letters for twenty years before slavery was abolished in England. 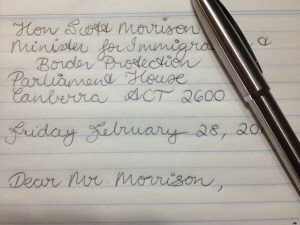 I have been writing to you regarding your cruel and inhumane asylum seeker policies and operations for almost five months now. I hope you are prepared for the next nineteen-and-a-half years of letters you will receive from me, should you remain in office that long. I have appealed to you on matters of language. This entry was posted in Uncategorized on March 1, 2014 by princessrantypants.